Get to know more about the basic composition of joint and spinal structures including disc, bones, muscles and joints. The cervical spine works to support the weight of our head which is heavy enough; a cervical spine is done with seven vertebrae, which helps the skull to move. The initial cervical vertebra is the atlas- a ring-like structure with two huge protrusions on sides to bear the weight of the head. The next cervical vertebra is the axis. The lumbar spine- the largest one has five lumbar vertebrae which is aligned like a reverse “C” almost like cervical spine, which helps in creating lumbar lordosis. It is the weight-bearing portion of the spine. The sacrum is a triangular shaped organ- made up naturally merged vertebrae, with sacral foramina into intervertebral foramen through spinal nerves. It is jammed between ilium, which contributes the pelvic girdle. It joins the spine with pelvis and to the lower part of skeleton. Each cluster of vertebrae distinct features and are intended for a precise purpose. Flex the spine by bringing the rib cage much closer to the pelvis region. Helps to turn the chest and steady the stomach. It acts like a usual mass belt- essential for trunk constancy in keeping waist area tight. These together form the back extensors and control spine movements at the lumbar, thoracic and cervical levels. These muscles are covered by a deep, membranous covering called the lumbodorsal fascia. In the cervical region this is continues into a similar tissue called as the nuchal fascia. 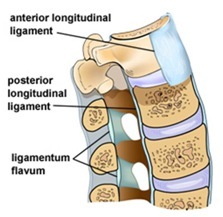 This covering or fascia, is connected or attached to various spinal ligaments including the supraspinal ligament, the iliolumbar ligament and the intertransverse ligament. It is also connected to the sacrospinalis and the transverses abdominis muscles. The spine is supported by a dense musculature. There are several muscles which originate in spine but remain attached with extremities. The major forms of muscles which affects the spine, creates and get involved totally upon the the spine and pelvis. 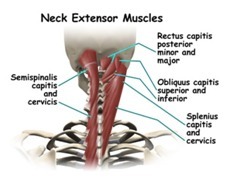 The neck flexor muscles are a large group and consist of muscles with dual actions like the sternocleidomastiod, which works for cervical flexion, rotation and extension. Similarly, scalenes, which originate on the ribs and get inserted over the cervical spine, work for cervical flexion, rotation and rib elevation. 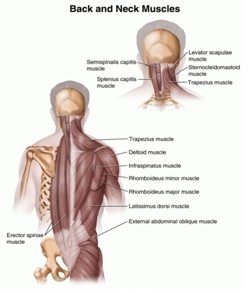 These muscles help in respiration and breathing cycle as well. The deep cervical neck flexors, the longus capitis and the longus colli, help in segmental movements and for stabilising the neck. They are supported and augmented by the long neck flexors the rectus capitis group. The spinal cord is compounded with millions of fibers, which forms like a tube in structure. It composed of millions of nerve fibers, which form a tube-like structure that extends from the brain to the region sandwiched between L1 and L2 vertebrae into the upper lumbar area. 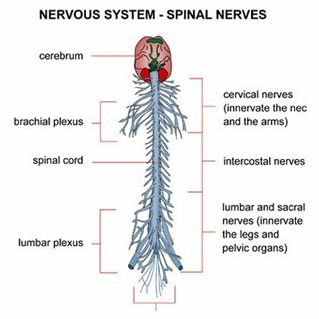 The nerve fiber branches off from spinal cord nerve roots, which are typically paired at each level including 32 pairs. The cervical nerve roots helps to connect upper body, hands, arms, nerve roots in thoracic spine. . These are known for the active support to the muscle; but there are many passive supports too. 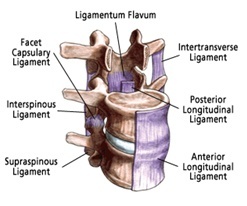 There are two spinal ligaments are: the transverse and the longitudinal ligaments which helps the spine movement. 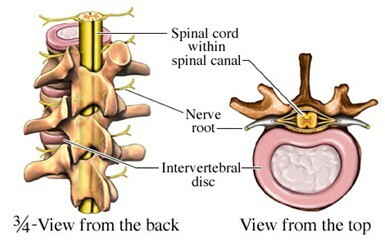 The intervertebral disc connects 2 vertebral bodies- known as a shock absorber of the spine, which is composed of two parts: The nucleus pulposus: a part which provides pressure regulation qualities to the spine. The annulus fibrosus: subject to attain the force applied by the nucleus in the spine during movements. The Sacrospinalis (Erector spinae) and its prolongations in the thoracic and cervical regions, lie in the groove on the side of the vertebral column. They are covered in the lumbar and thoracic regions by the lumbodorsal fascia, and in the cervical region by the nuchal fascia. This large muscular and tendinous mass varies in size and structure at different parts of the vertebral column. In the sacral region it is narrow and pointed, and at its origin chiefly tendinous in structure. In the lumbar region it is larger, and forms a thick fleshy mass which, on being followed upward, is subdivided into three columns; these gradually diminish in size as they ascend to be inserted into the vertebrae and ribs. The Multifidus (Multifidus spinae) consists of a number of fleshy and tendinous fasciculi, which fill up the groove on either side of the spinous processes of the vertebrae, from the sacrum to the axis. In the sacral region, these fasciculi arise from the back of the sacrum, as low as the fourth sacral foramen, from the aponeurosis of origin of the Sacrospinalis, from the medial surface of the posterior superior iliac spine, and from the posterior sacroiliac ligaments; in the lumbar region, from all the mamillary processes; in the thoracic region, from all the transverse processes; and in the cervical region, from the articular processes of the lower four vertebrae. Each fasciculus, passing obliquely upward and medial ward, is inserted into the whole length of the spinous process of one of the vertebrae above. These fasciculi vary in length: the most superficial, the longest, pass from one vertebra to the third or fourth above; those next in order run from one vertebra to the second or third above; while the deepest connect two contiguous vertebrae. The sacrospinalis, working through its smaller segmental parts, is responsible for extension movements in the lumbar, cervical and thoracic parts. The segments working on each side also help with the rotation and side flexion movements. 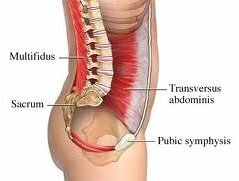 The sacrospinalis working as a single unit helps in maintaining an erect back and is essentially a postural muscle. The Splenius capitis arises from the lower half of the ligamentum nuchae, from the spinous process of the seventh cervical vertebra, and from the spinous processes of the upper three or four thoracic vertebrae. The fibres of the muscle are directed upward and lateral ward and are inserted, under cover of the Sternocleidomastoideus, into the mastoid process of the temporal bone, and into the rough surface on the occipital bone just below the lateral third of the superior nuchal line. The Splenius cervicis (Splenius colli) arises by a narrow tendinous band from the spinous processes of the third to the sixth thoracic vertebrae; it is inserted, by tendinous fasciculi, into the posterior tubercles of the transverse processes of the upper two or three cervical vertebrae. The Splenii of the two sides, acting together, draw the head directly backward, assisting the Trapezius and Semispinalis capitis; acting separately, they draw the head to one side, and slightly rotate it, turning the face to the same side. They also assist in supporting the head in the erect position. 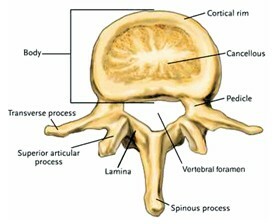 The vertebrae from thoracic, cervical, and lumbar are separate yet possess common features. The vertebral body is a solid accumulation enables the process of weight bearing. 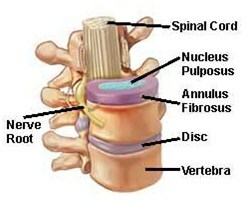 The intervertebral disc is again another which is sandwiched within two vertebral bodies. 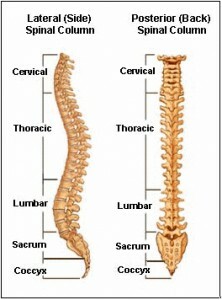 The spinal canal is the unfilled organ from which the spinal cord passes. The bony pedicels are an option which gives rise to bony projections from spine. The pedicle is a paired; each pedicle comes from side comes of vertebral body- which projects the back. The lamina is shingle-like shield of bone. As the lamina comes into a mutual at back of spinal column, it joins to shape the spinous process. Each vertebral has two articular processes; one at the top and bottom, where the lamina pedicle meets- to make a facet joint. There are two facet joints; two facet joints and intervertebral disc allow at each level the motion, between two vertebral bodies.